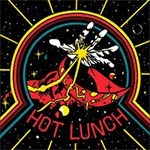 Dj Astro's: Hot Lunch: House of Whispers 12"
Hot Lunch is a cool new, energetic hard rock band from San Francisco playing very late 60s/early 70s styled fuzz rock with some punk, garage, progressive and acid rock influences. The band released their debut album last year on Who Can You Trust? (Europe) and Tee Pee Records (US) and there have also been a few 7" releases. Although I must say I've sort of had enough of this 60s/70s retro hard rock revival boom that has been going on for years and years in Europe (just look at Sweden!!) and US, this kind of music works very well especially live after you've had a few beers. And the best bands in this bandwagon are truly excellent and authentic! Luckily Hot Lunch is one of the best in this genre, raw, in-your-face and honest. They're actually often more punk than hard rock, so maybe I shouldn't really label them like this after all... Too bad that their planned Helsinki show was dropped earlier this year. This new, limited 12" EP has five new tracks, that all sound like they're recorded in 1969 or something like that. I'm reminded of Sir Lord Baltimore and several others. The title track "House of Whispers" is a mid-tempo hard rocker with some more atmospheric parts mixed in for good measure. Some parts remind me of 70s KISS... "There's Nothing Like Revenge for Getting Back at People" has been previously released on a split 7" with Lecherous Gaze and also includes both raw, hard rocking riffs and also some soulful, more mellow parts. Very nice. The last song on side A is called "Hooray For Everything" and it has a raw, energetic and punky garage feel to it, although it also has some cool melodies. On side B we've got a couple of little longer (four to five minute) songs. "Ballad of Heckler Hill" sounds sort of theatrical but quite interesting with many different parts, while "Period Incorrect" is a bit slower 70s hard rock piece that really gets moving with a faster, wild solo part in the middle. The band also knows how to rip it! I like the basic riff on this one, perhaps my favorite track on the EP. I hope to get to see these guys live since I'm sure their stuff will make the audience crazy!